Casino Royale: Back to basics? So they’re silly. So they’ve been going since the ’60s. So this is the twenty-first (official) outting of the sixth incarnation of a spy who has survived promotion, demotion and the Cold War. It’s a Bond film, and one purporting to go ‘back to basics’ with a new face and a general overhaul for the series. As one of those heretics who preferred the slightly heightened realism of the Timothy Dalton era, this film showed plenty of promise with a conspicuous absence gadgets, a somewhere near realistic plot, and nary a nuclear device in sight. It’s been compared to the series reboot that Batman Begins provided, and for all its grittiness and mortality of the main character, has been lauded by the critics, whilst simultaneously pleasing fans for remaining true to the Bond brand. Daniel Craig proved to be a controversial choice, but from his experience behind the lines in Archangel and some technical bomb-making expertise in Munich, he came well prepared to play the UK’s most dangerous export. Warning, possible spoilers after the break! So it is with some disappointment that I say this film wasn’t quite all I’d hoped it might be. The opening scenes proved Bond is still bulletproof, even if he struggles a bit more in the hand-to-hand business, he’s still happy to kill and injure innocents, he can still outrun even the fastest of adversaries, and they will still only shoot him point-blank when their clips are empty. Nevertheless, at least the plot shows some logic to it this time; Bond gets reprimanded for his actions in the opening scene, the plot surrounding the poker game is reasonably well thought through and generally entertaining. It can be forgiven for its fairly wooden characters, this is a Bond film after all, and should be lauded for at least breaking the mould in depicting the main characters outside of the stereotype (Le Chiffre and his Ugandan clients, Bond and his, ehm, chair). If anything, unfortunately, the main plot suffers because it is all over a little too quickly, leaving the remaining hour to seemingly endless double-crossing. And I hope I’m not alone in finding the line “It’s the tell! Bond was right…” distinctly cringe-worthy. However, Craig puts in another admirable performance in his new role. Perhaps it is unduly harsh to criticise the plotline when there is much to be thankful for in this remake of the series. Even the opening titles offer something a little novel (a distinct lack of women, for starters), and the reliance on overt action scenes and futuristic gismos has been at least partially shelved for something more akin with the public’s imagination of the secret services. Bond is still adept at handling his gear, but it’s more in the line of laptops and mobile phones than remote controlled cars and laser-equipped watches. Apparently the film forms something of a two-parter with the upcoming Bond 22, and Casino Royale certainly offers much for the series to build upon. Here’s to hoping they stay aloof of the sort of tripe which the franchise resorted to with Brosnan as the lead. And so is Eva Green (adept at handling Bond's gear, that is). I was delighted with the movie–I had expected Die Another Day, but it seems like they finally came to their senses and made a Bond movie that wasn't a ridiculous caricature of a franchise that was already a ridiculous caricature of a book character who was already a ridiculous caricature of reality. 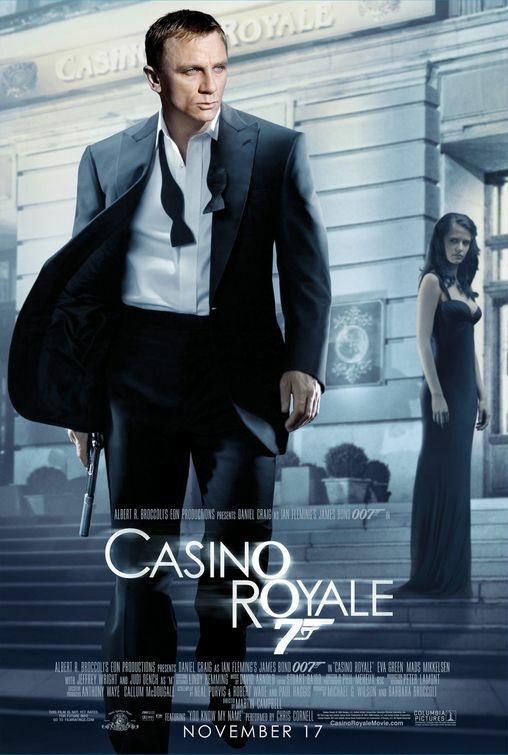 And the numbers seem to bear out–Casino Royale is already the highest-grossing Bond film of all time. With the possible exception of unabashed product placement, I couldn't have really asked for any more from it. If the rumours of it being a two-part storyline are true, presumably tied to Mr White's involvement, it'll be interesting to see if they can keep the momentum going. Damn fine thing it wasn't another Die Another Day though!